After much anticipation, the moment we've all been waiting for finally arrived in the early hours this morning as the Solar Impulse airplane embarked on the the historic cross-country flight. At about 6:00 a.m., pilot Bertrand Piccard took off from Moffett Field at NASA Ames Research Center in Mountain View, CA, heading southeast, towards Phoenix -- the next stop in the cross-country voyage. From there, the Swiss-made plane will make its way towards New York City, and it'll do so without using a single drop of fuel. The Solar Impulse plane is an entirely sun-powered, single-seat airplane that is capable of flying for 36 hours consecutively. In late March we got our first glimpse of the Solar Impulse, and last week it completed its final test flight before embarking on the coast-to-coast flight. The amazing plane’s wingspan of 208 feet is as wide as that of a Boeing 747, and at just 3,500 pounds, it weighs about as much as a small car. The Solar Impulse is the first airplane ever to be able to fly both day and night using solar energy. Its wings are covered with 12,000 solar cells, which are used to charge the 881 pounds of lithium-ion batteries it carries. Once fully charged, those batteries enable the plane to fly all night. Piccard and Borschberg will be taking off very early and landing very late on each flight in order to avoid commercial traffic and turbulence. “I went to bed very early; I was 9:00 in bed,” Piccard told the bleary-eyed press. It’s kind of strange to see an airplane of its size flying at such low speeds. After taking flight, it took several minutes for the plane to gradually shrink into the sky. The solar-powered plane only travels at an average speed of about 40 mph, and the trip across the US will be broken into five flights that are each about 20 hours in duration. After landing in Phoenix, Piccard will hand the plane over to Solar Impulse co-founder André Borschberg, and the two pilots will alternate flying for the cross-country flight. In mid-May, Borschberg will fly from Phoenix to Dallas, and from there, it will make stops in St. Louis and Washington, D.C. before reaching New York in early July. Last year, the Solar Impulse successfully flew from Switzerland to Morocco. Prior to that, it completed a 26-hour overnight flight. After completing the cross-country flight, Piccard and Borschberg will begin preparing for an around-the-world voyage in 2015. But in order to circumnavigate the globe, the team will need to employ a newly-designed aircraft with updated systems and enough cargo room for sleeping space for flights that would last as long as five days. All photos by Mark Andrew Boyer for Inhabitat. 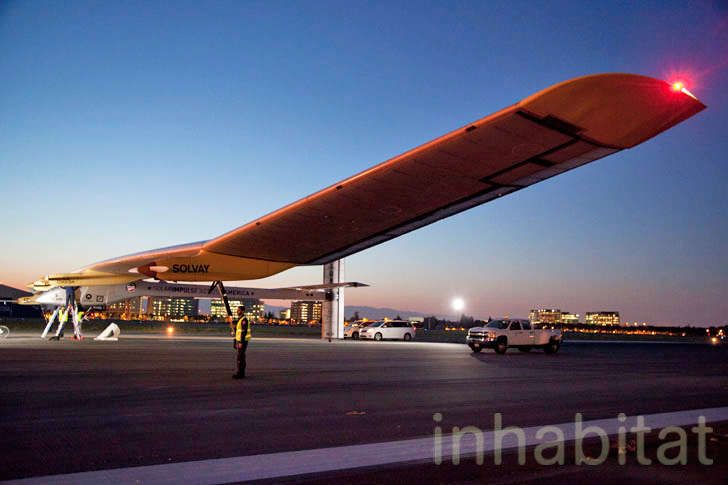 To view more photos of the Solar Impulse launch, visit Inhabitat’s Flickr page. The Solar Impulse plane is an entirely sun-powered, single-seat airplane that is capable of flying for 36 hours consecutively. In late March we got our first glimpse of the Solar Impulse, and last week it completed its final test flight before embarking on the coast-to-coast flight. The amazing plane's wingspan of 208 feet is as wide as that of a Boeing 747, and at just 3,500 pounds, it weighs about as much as a small car. The Solar Impulse is the first airplane ever to be able to fly both day and night using solar energy. Its wings are covered with 12,000 solar cells, which are used to charge the 881 pounds of lithium-ion batteries it carries. Once fully charged, those batteries enable the plane to fly all night. Piccard and Borschberg will be taking off very early and landing very late on each flight in order to avoid commercial traffic and turbulence. "I went to bed very early; I was 9:00 in bed," Piccard told the bleary-eyed press. "It's a fabulous way, I believe, to promote clean technologies, to show what our world could do if we're really applying these technologies everywhere. We have to understand that the technologies that we have on board, if they were globally used everywhere -- also on the ground -- could help our world to divide by two its energy consumption and to provide half of the rest with renewable sources. That's why thousands of people have signed up to support this Clean Generation initiative. "It's kind of strange to see an airplane of its size flying at such low speeds. After taking flight, it took several minutes for the plane to gradually shrink into the sky. The solar-powered plane only travels at an average speed of about 40 mph, and the trip across the US will be broken into five flights that are each about 20 hours in duration. "Our priority is not the speed," explained Piccard. 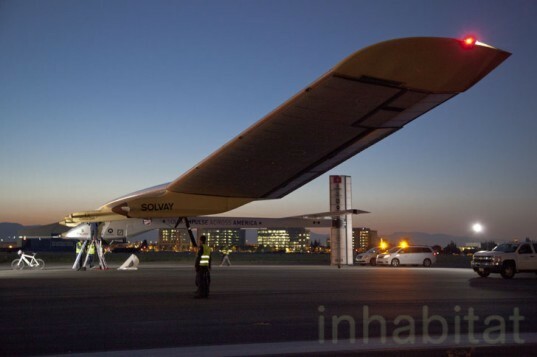 "Our priority is the duration -- to be able to fly as long as we wish, just on solar power. What we look for is to have a new milestone in this very exciting history of aviation that can attract the interest of the political world and the media, and show that for renewable energies and clean technologies, and for energy efficiency we can achieve impossible things." 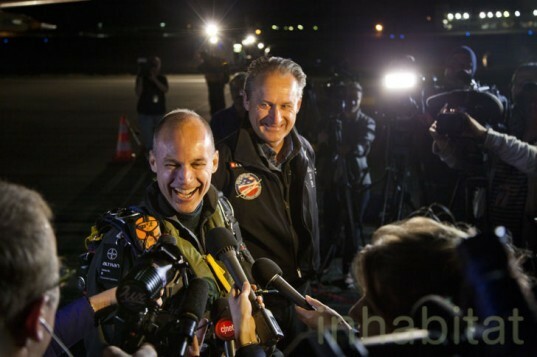 After landing in Phoenix, Piccard will hand the plane over to Solar Impulse co-founder André Borschberg, and the two pilots will alternate flying for the cross-country flight. In mid-May, Borschberg will fly from Phoenix to Dallas, and from there, it will make stops in St. Louis and Washington, D.C. before reaching New York in early July. Last year, the Solar Impulse successfully flew from Switzerland to Morocco. Prior to that, it completed a 26-hour overnight flight. The Solar Impulse plane is an entirely sun-powered, single-seat airplane that is capable of flying for 36 hours consecutively. In late March we got our first glimpse of the Solar Impulse, and last week it completed its final test flight before embarking on the coast-to-coast flight. The amazing plane's wingspan of 208 feet is as wide as that of a Boeing 747, and at just 3,500 pounds, it weighs about as much as a small car. The Solar Impulse is the first airplane ever to be able to fly both day and night using solar energy. Its wings are covered with 12,000 solar cells, which are used to charge the 881 pounds of lithium-ion batteries it carries. Once fully charged, those batteries enable the plane to fly all night.